After Innotech donated $5000 to help kids suffering from burns, the Royal Children’s Hospital Foundation released the following media report. Queensland company, Innotech Guardian Safety Systems, recently donated $5000 to the Royal Children’s Hospital Foundation to aid children with burns. The money was received after Innotech won an award in the 2008 Premier of Queensland Smart Awards, in the category of Small-to-Medium Manufacturing and Mining Award. Innotech Directors, Michael and Ben Miranda announced their intention to donate half the prize money at the awards ceremony. This apparatus enables firefighters to communicate with each other more safely and efficiently. CEO of the Royal Children’s Hospital Foundation, Karenlee Spillane said donations from local businesses are invaluable in the quest to work wonders for kids with burn injuries. As the largest paediatric burns centre in Australasia more than 600 children are admitted for specialist treatment every year. “We are very thankful to Innotech and the Miranda family for their donation to ensure kids with burn injuries have every opportunity to regain good health,” Ms Spillane said. Photo (Left to Right) : Belinda Wallis, Burns Prevention Researcher - RCH Burns Research Group, Ben Miranda, Financial Administrator, Innotech, Michael Miranda, Operations Manager, Innotech, Bill Maddock, Director Community Relations, Royal Children’s Hospital Foundation. 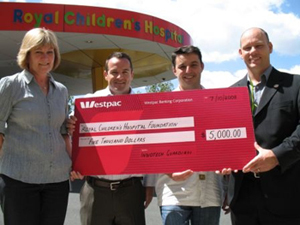 Ben and Michael Miranda of Innotech outside the Hospital, presenting their donation to the Royal Children’s Hospital Foundation and the Burns Research Group.